Fortunately, I have it my power to supply deficiencies. Susan Rubin (Colorado) Mesmerize:Echinops tjanschanicus, Globe Thistle. 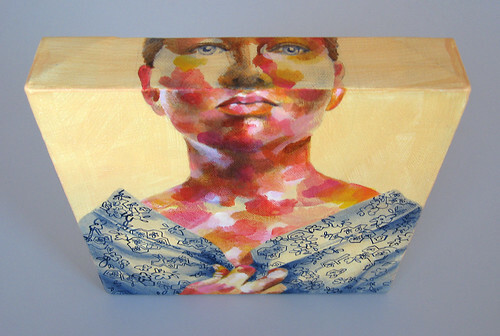 18 x 18 x 2 inches, colored pencil on Mylar on Claybord. * The title of this post comes from the novel Jane Eyre. Click on any image to view its source. Lynda Schlosberg: Diffraction. Acrylic on panel, 30 x 30 inches. A chart of grammatical terms from the constructed language Lojban. Image credit unknown. An island micronation. Photo credit unknown. Micronations, sometimes also referred to as model countries and new country projects, are entities that claim to be independent nations or states but which are not recognized by world governments or major international organizations. Micronations are also distinguished from imaginary countries and from other kinds of social groups (such as eco-villages, campuses, tribes, clans, sects, and residential community associations) by expressing a formal and persistent, even if unrecognized, claim of sovereignty over some physical territory. Several micronations have issued coins, flags, postage stamps, passports, medals, and other items, which are rarely accepted outside of their own community. Doug Chayka: What Remains. The Euro crisis and the dissolution of the European social ideal. (Detail view). Illustration for The Nation. Choos, oil on canvas, 2005 by Sarah Atlee. Some rights reserved. In all my years of art school, nobody told me that mixing brown and white would make blue. Cool. 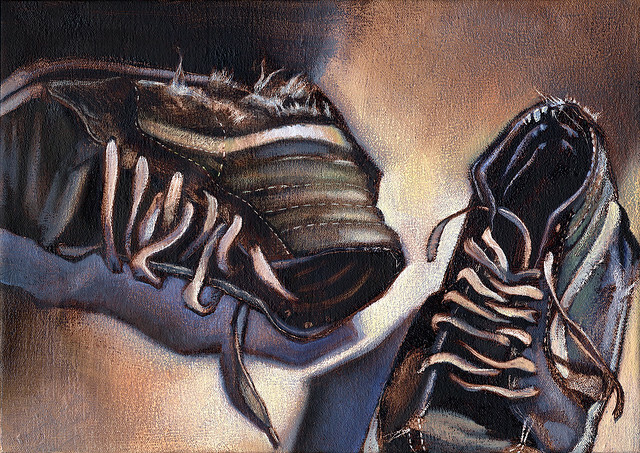 This still life painting is of one of my beloved pairs of Vans Sk8-Hi Tops. The details are scratched out using an X-Acto knife. Painted under the instruction of Robert Heischman at the Rochester Institute of Technology. Three Lucky Pennies will be in the annual Small Works show at JRB Art Gallery at the Elms in Oklahoma City (map link) for the month of November 2010. The opening reception is Friday, November 5th, 6-10 pm. 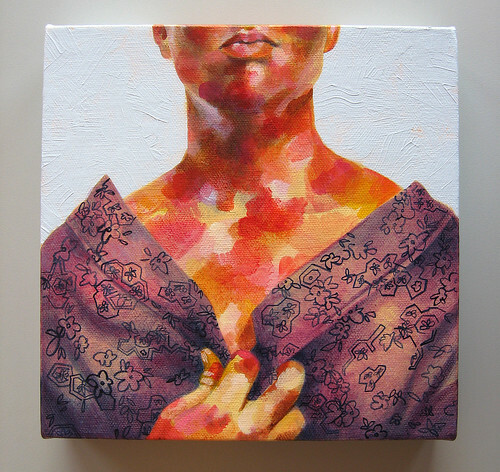 The Small Works show at JRB will feature 100 8x8-inch canvases by 100 artists, each piece priced at $180.00. Artists Skip Hill, Nick Wu, Carlos Tello and Sohail Sheheda will be featured in the gallery's other spaces. Here's a look at how I created this piece. The idea for this self portrait popped into my head a couple of weeks ago. I imagined a ratty, thrift-store leopard-print coat, but that item seems to be missing from my closet. I took reference photos of myself wearing this wonderful purple kimono that my Mom has had for years. I settled on the two best shots, and spliced them together in PhotoShop. I always enjoy painting the edges of a canvas. 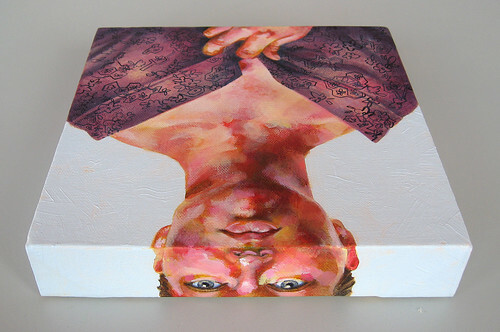 Luckily, the canvases this gallery provides for the Small Works show have lovely 1.5" edges. Using Adobe InDesign, I created a grid and placed my reference photo under it. This is a useful tool when working from a single reference. 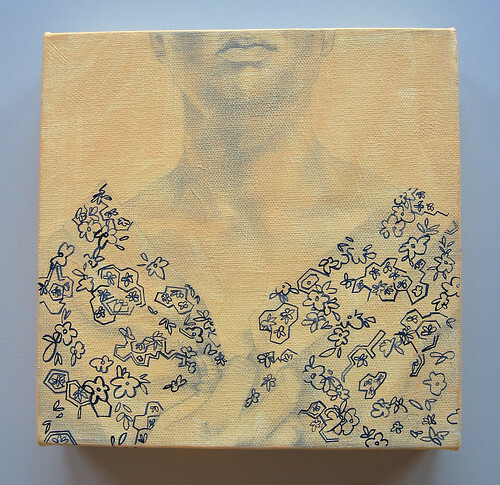 This is an unofficial companion to my painting for 2009's Small Works show. I like to see what I can squeeze onto the edge. I had to turn this painting around in just a couple of days, so I knew that a good underdrawing would be key. I couldn't afford to take time working all the shadows out in paint alone. I often do underdrawings in graphite, and I prefer not to use spray fixative because it's water-resistant and stinky. Here I've blended the shadows using my finger, from which a small amount of skin oil helps the graphite adhere to the canvas. When I put the first wash down, I do it gently, so as not to smear the drawing. One acrylic wash seals it. Usually I put down a burnt sienna or pepto-bismol-pink wash for figure painting, but I pictured this piece with yellow undertones. The wash here is a mixture of Naples yellow and a cadmium-based pale pink. When painting patterns, I prefer a loose interpretation to a slavish reproduction. 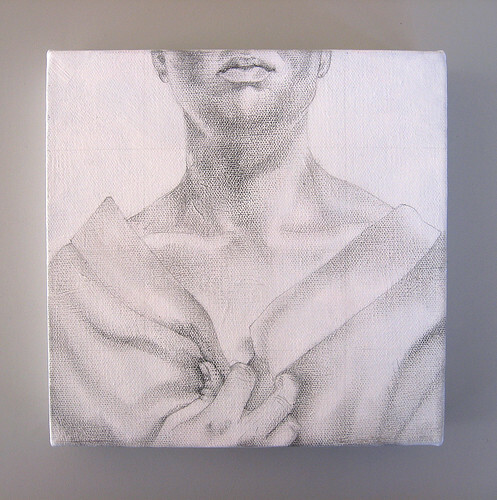 I drew the pattern on the canvas in pencil, mostly not looking at what I was drawing. (I love drawing blind.) I went over the lines using Payne's gray and a #1 liner brush. I put in the big shadows with Payne's gray (how I love thee), and began blocking in the skin tones with quinacradone violet, napthol red, titanium white, Indian yellow, Naples yellow, Pyrrole red, light umber, and burnt sienna. These days I'm using a lot of Golden Fluid Acrylics, recommended to me by professor Bob Dorsey for their high pigment concentration and versatility. He also recommends Windsor Newton Series 7 brushes, which are indeed "worth every penny." Here I've added washes of quinacradone violet and more Payne's gray to the robe. Continuing to block in the skin tones. The background is tinanium white with just a drop of Payne's gray to cool it off, and contrast with the warmth of the figure. I laid it on thick, allowing hints of the yellow underpainting to show through. To finish, I overglazed the skin with more titanium white, napthol red tint, and Naples yellow, using some Golden glazing medium in yellow ochre and iridescent red. More glazes of quinacradone violet were added to the robe. Keith Haring knew that anything worth drawing once was worth drawing a hundred times. I like to go to movies and draw in the dark. And I love love love blind gesture drawing. Participate in the quarterly Worldwide Sketch Crawl Day. Illustration Friday suggests a new topic once a week! Following are some idea-generation links oriented toward writers, but they could just as easily apply to image-makers. Now rock out with your socks out. 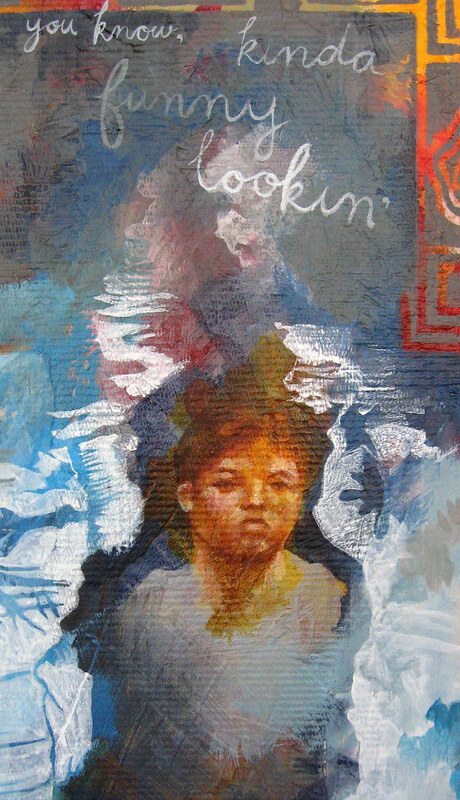 Whatcher Yennough, Patron Saint of First Impressions, acrylic and collage on found plywood, 2009. (Detail view.) Click image to view source. He's, I don't know, maybe medium-sized, you know, average height, with short brown hair. I think he wears glasses. Eyes? Maybe bluish-brownish. Kinda dark, but, you know, not like dark dark. He was kinda funny-lookin'. Whatcher is available at aka gallery in Oklahoma City. Detail views here and here.